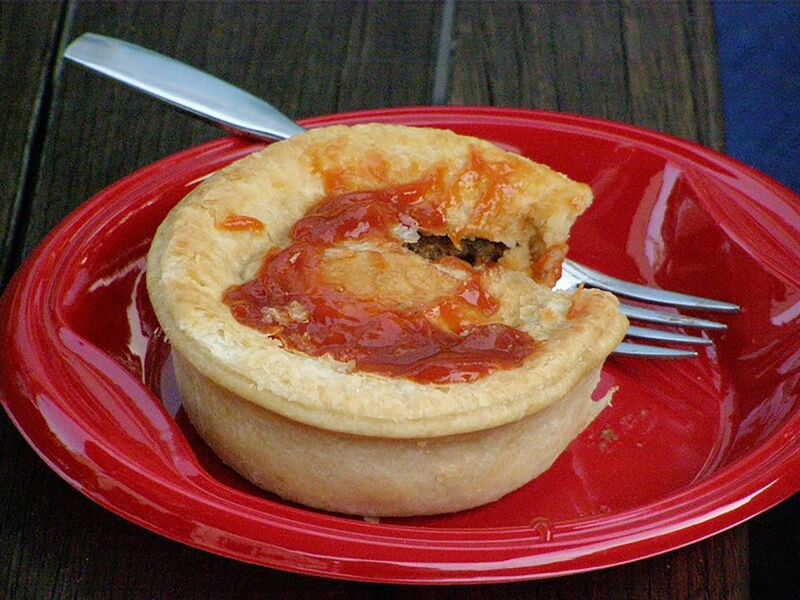 The meat pie is considered an iconic food in both Australia and New Zealand. And, while over the years tastes have evolved, the pie continues to have a firm place in the hearts and palates of both countries. Meat Pies are very popular at sporting events and on construction sites because they are so portable. They were the original sack lunch for miners, farmers, and others who couldn't leave their work for a meal. They also make a delicious party or picnic food and are simple to make. Heat 1 tablespoon olive oil in a skillet over medium-high heat. Add 1 medium finely chopped onion and fry for 3 to 4 minutes or until soft and translucent. In a small container, whisk together 1 tablespoon cornstarch and 1 tablespoon of the beef stock and set aside. Add remaining beef stock, 1/8 cup tomato paste, 1 tablespoon Worcestershire sauce, and Vegemite or bouillon cube to ground beef in skillet. Stir well to combine. Add reserved cornstarch-water mixture and stir. Bring to a boil, reduce heat to low and simmer, uncovered, for 10 minutes or until thick. Remove from heat and cool. Heat oven to 425 F (220 C). Place pie dough on a lightly floured surface. Place a pie tin on top and cut a circle around it. Repeat process to make 3 more circles—these are the pie tops. Cover loosely with plastic wrap and set aside. On the same lightly floured surface, place remaining pie dough and a pie tin on top and cut a circle that's slightly larger than tin (about 1/2 inch bigger)—this is the pie base. Repeat process to make 3 more bases. Press base pastry into pie tins and press up the sides. Fill with cooled meat mixture. Brush rims with water. Place pie tops over meat. Use a fork to press edges to seal. Trim edges if necessary. Brush tops with beaten egg. Place pies on a baking tray to catch any drips and bake for 20 minutes or until golden. Serve with tomato sauce (ketchup).